Worst credit card..customer service. Accidently entered one wrong number in my phone number on application so I can't use the card. Was told by the supervisor that they won't update my phone number so the card is useless. I applied for this card on November 29th. Paid the $89 on november 30th. Was told it would be 7-10 business days to receive the card. I waited until 12/14 and called was told it didnt go put until 12/4. I gave it until Dec. 20th and called again told i wanted a supervisor. Supervisor Robert said due to a plastic backorder the card was mailed on 12/19 when asked if i needed ro wait another 7-10 business days i was told no i should receive the card by 12/21 or 12/22. I gave it until today 12/26. I called again spoke to agent Dan and he put his supervisor David on the phone and said yes the card went out on Dec 19th and it should be 7-10 business days and i should have by Jan 3rd. He gave me some sob story about hurricanes and the USPS holding things up. He said what they may do is just kill the one that was sent out and refund my money and re issue me another card. I told the guy i will give it till Jan 3rd and dont kill the card because if they have to refund me my $89 i will not re apply for the card. My suggestion would be to go with Milestone. I applied for their card on December 14th and received their card on 12/24 no upfront fee and a credit limit of $300 with annual fee of $75. Fit has one more week. Then they will refund my $89 i will not pay them another dime toward any yearly fees and they can keep their card. I applied and was approved for 400 credit limit. I paid the 89 dollars which is normal for most credit building cards. I was able to start using my card that day. The next day I tried to use it the charge was denied. When i called the person on the other live of customer service was so blatantly rude and sounded as if she did not want to speak. I was told I made to many transactions and the card was put on hold until tomorrow. This makes no sense. Capital one and first premier are the very best with credit building never had a problem with them and capital one will give you a limit increase add long as you pay on time. Haven't sent in my 89. dollar deposit, but I don't like the idea my payment will be on hold for 7 days. Other reviews of not receiving my the card yet after 10 days does not appeal to me. I was approved and paid my annual fee of $89.00 and still have not received my card. I called and they told me last week it was in the mail. still haven't received anything??? I receive message after message (for weeks now) that the credit card has been sent and requesting the processing fee. The representative I just spoke to told me that the card will be mailed when I pay the fee. So, they are lying to me. Either about the credit card already being sent or that I have to pay the fee before they will send it. Reporting this to the BBB, the Federal Trade Commission, and my state Attorney general. I do not recommend this card at all. I reluctantly paid an $89 processing fee for a $400 credit limit to continue building my credit after a bankruptcy 1 year ago. When I called to activate the card I was then told by a customer service representative who sounded very tired (and/or stoned) that a $99 annual fee had been applied to the card as well. When I questioned why I was given a generic answer about terms being based on my credit. I again questioned why I had to pay an $89 processing fee then and was again given a generic answer about terms of approval being based on credit. I then stated I didn't want the card then and wanted to be refunded the $89. I was then told that I could pay the balance of $99 and then cancel the account and the $89 would then be refunded. I then questioned again, "So basically you just stole $99 from me either way? Whether I keep the card or cancel it?" She replied that I agreed to the terms of the card. I again stated that I agreed to pay the $89 processing fee. I was never told about the $99 annual fee until today when I called in to activate the card and no I do not agree to the terms, hence why I do not want the card. She again told me I could pay the balance of $99 and then cancel the account and the $89 would then be refunded. I hung up at that point. I do not recommend this card at all! I was approved but was asked to put a $150 deposit for a $500 limit. I decided to accept it and made the deposit. One thing to be aware of is that it took about 10 days for that deposit to clear. My payments also took about 7 days to clear. So my best advice is just to use 10% to 20% of you limit (for credit utilization purposes) so that you can still use the card while the payment is on hold. I wrecked my credit when I was young and just recently through a job loss. I have been rejected by a couple of secured cards like US Bank and even Citi. I also got turned down by Credit One. I took a chance when I got this offer in the mail and was approved. The fees are high but I guess that there is a price for rebuilding. The only complaint I have is that they put your payments on hold for 7 days. I got the mail and here were the terms offered to me. $125 AF. From 2nd year, it becomes $96. $10 a month fee from 2nd year onwards. The fees are absolutely crazy. I'll stick to my capital one and needless to day, I did not apply. My score was about 583 TU though (as a reference). Ruined my credit because of bad choices I had made and a lot of it was due to ignorance on my part. I have the opensky secured card at the moment (it is a good card) and I am now looking for an unsecured card rather than another secured one. I got the pre-approved offer in the mail and I applied and got approved. I had to deposit $150 though to get the $500 limit. I decided not to proceed since I am looking for an unsecured card. I got the offer in the mail and decided to bite the bullet. The fees are high but I am willing to pay the price to rebuild. I think the plan is to charge just about $30 to $50 a month on the card and pay it off in full. And then cancel before the year and annual fees are up. I would say that I am currently in the second phase of my rebuilding. I already have 2 secured cards and am now looking to step up to getting an unsecured card. I have been rejected by credit one and first premier. So I decided to get this card even though the fees are high compared to credit one. I got approved for $500. The high APR does not bother me since I pay my bills in full every month. Please be aware of the payment holds - about 7 to 10 days. Got 2 pre-approved mails, one from fit and the other from reflex. When I looked in greater detail, I realized they are from the same issuer. 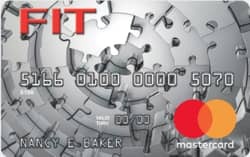 I have been denied by a few other cards so I applied just for the fit and got approved for $500. The fees are high but I guess I have to live with that for a while as a rebuilder. Got the offer in the mail and decided to apply. I got approved but had to deposit $150 to get the $500 limit. I got the pre-approved mail and applied. These are the terms I got. Annual fee: $125 for the first year, then $96. Monthly Fee: None for the first year, then $10 a month which makes it $120 a year. Limit I got was $500. Aside from this card, I also got a Credit One card with a $75 annual fee. I got this card offer in the mail along with another card called reflex. It looks like it is from the same folks because the fees are the same. My credit is in the dumps now after a divorce. So I took the plunge and applied. I was approved but it was not instant or immediate. I had to make call them to verify address, utility bill etc. I was approved for $500 but had to put a $150 deposit. I plan to use this for less than a year and then cancel the card. Hopefully, I would be able to get a lower fee card then.